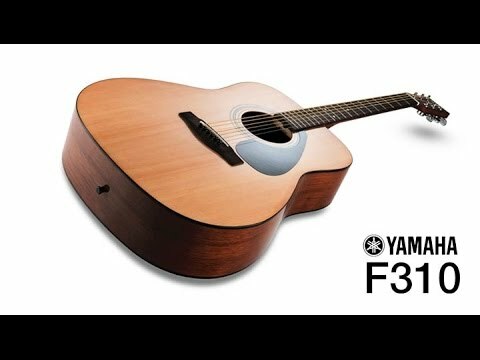 The Yamaha F310 Standard acoustic guitar pack delivers an outstanding model for those who're new to the instrument and are looking for an affordable model to get started on. Yamaha's reputation for building outstanding instruments extends across their entire range, so you can rest assured that the F310 is crafted to the same impeccable standard. As well as the acoustic guitar, the pack includes a Guitar Tutor DVD. The body shares a similar profile to that of a dreadnought but has a slightly shallower body depth to make it more comfortable to play. The body also has a shortened scale length to make it more accommodating, enabling those with a shorter range of movement to access to reach each and fret with ease, building new guitarist's confidence along the way. The back and sides of the body are crafted using meranti, which shares similar tonal characteristics to mahogany. The back and sides are responsible for creating the bouncy mid to low power with a driving force. The body top is made using spruce, a highly resonant tonewood that projects plenty of energy with ease. The spruce offers a sharpness that cuts through the meranti to ensure each and every note rings out with the utmost clarity. The Yamaha F310 is fitted with a solid nato neck that reinforces the sustain generated by the strings superbly. The slender feel of the neck makes it a delight to navigate along. Married to the neck is a rosewood fingerboard, which is home to 20 frets and guarantees a sumptuous playing feel. The nut and bridge work tirelessly to maintain intonation and sustain across the entire 25-inch scale length. Tuning integrity is upheld accurately by the carefully selected chrome open-tuners, throughout every performance. The natural finish of the tonewoods is allowed to shine brightly, with nothing to inhibit the gorgeous character the wood grain from being displayed proudly. A slender layer of gloss prevents unwanted rubbing or superficial marks causing damage to the tonewoods. A cool black pickguard protects the underside of the soundhole from nicks and scrapes that can occur during a performance. Whether you prefer to play in your room or onstage, you'll always feel at home with this acoustic guitar in your hands. At this price you'll seriously struggle to find a guitar that can come close to the playability, tonal versatility and build quality. Posted on 11/09/2012 by avengedsevenfoldwins I got this guitar for Christmas 2011 and I really liked it. It gives you tone you need for not just beginning but professional playing. I think I will never need to buy another acoustic. Posted on 13/02/2012 by Daz Sounds great for its price bracket. Only winge is that it goes out of tune if like me you're fond of string bending.